The Prohibition of Female Genital Mutilation (Scotland) Act 2005 (asp 8) was passed by the Parliament on 26th May 2005 and received Royal Assent on 1st July 2005. This Act is applied in Scotland. In Wales, North Ireland and England the UK 2003 Female Genital Mutilation Act applies. The text of the Prohibition of Female Genital Mutilation (Scotland) Act 2005 (asp 8) can be accessed in this LINK. This entry was posted in Actors, Blog, Governments and tagged Crime/legislation, Government Regulation, Legislation as Topic, Scotland, United Kingdom on February 20, 2015 by gmartinezgabas. 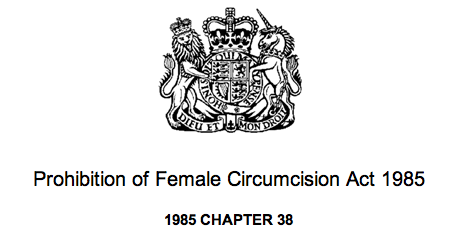 The Prohibition of Female Circumcision Act 1985 was an act of the Parliament of the United Kingdom that made female genital mutilation a crime in the United Kingdom. This Act has been replaced by the UK Female Genital Mutilation Act 2003. This entry was posted in Actors, Blog, Governments and tagged Crime/legislation, Government Regulation, Legislation as Topic, United Kingdom on February 20, 2015 by gmartinezgabas. 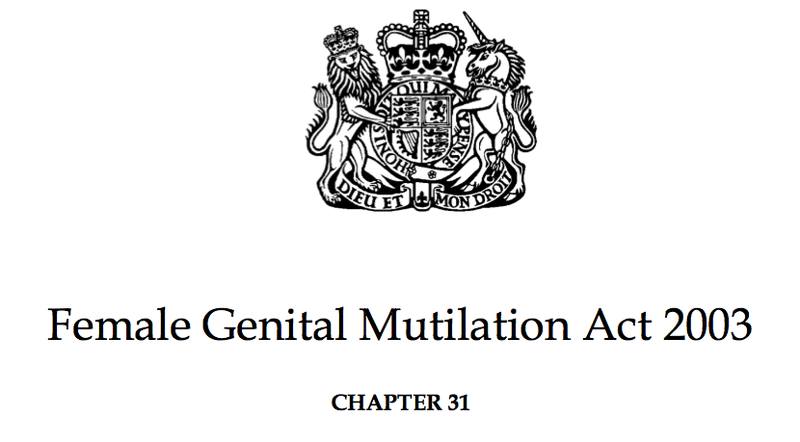 The Female Genital Mutilation Act 2003 (c. 31) is an Act of the Parliament of the United Kingdom that is applied in England, Wales and Northern Ireland. An NHS trainee obstetrician who faced the first prosecution in the United Kingdom for female genital mutilation has been acquitted after the jury deliberated for less than half an hour. Dhanuson Dharmasena, then a junior registrar in obstetrics and gynaecology at the Whittington Hospital in north London, was accused of reinfibulating a Somali woman by sewing her labia together after the birth of her first child in 2012. But he told the jury that he had put only a small suture at the top of a cut he had made to deliver the baby, to stop bleeding, in an emergency situation. This entry was posted in Archives, Blog, News and tagged Crime/legislation, Ethics/Medical, Legislation as Topic, United Kingdom on February 10, 2015 by gmartinezgabas. J Obstet Gynaecol Can. 2014 Aug;36(8):671-2. Comment in J Obstet Gynaecol Can. 2014 Aug;36(8):672. This entry was posted in Archives, Blog, News and tagged Legislation as Topic, Obstetric Labor Complications, Reconstructive surgical procedures, Reinfibulation* on December 25, 2014 by gmartinezgabas. The NHS displays absurd double standards on circumcision. Nurs Stand. 2014 Jun 4;28(40):35. doi: 10.7748/ns.28.40.35.s46. I support the law in the UK against female genital mutilation (FGM) and the fact that staff in acute hospitals are now mandated to record information on a national database about women and children who have undergone FGM (News May 28). This entry was posted in Archives, Blog, News and tagged Crime/legislation, Law enforcement, Legislation as Topic, Outpatient Clinics/Hospital, United Kingdom on June 27, 2014 by gmartinezgabas. First UK prosecution for female genital mutilation raises concerns among doctors. BMJ. 2014 Mar 27;348:g2424. doi: 10.1136/bmj.g2424. Obstetricians have said that the first prosecution for female genital mutilation (FGM) in the United Kingdom could lead doctors to fear criminal charges if they carry out repairs to stop post-birth bleeding in women who have previously been subjected to the illegal procedure, which has been a specific crime in the UK since 1985. This entry was posted in Archives, Blog, News and tagged Crime/legislation, Legislation as Topic, Physician-Patient Relations, Reconstructive surgical procedures, United Kingdom on April 14, 2014 by gmartinezgabas.